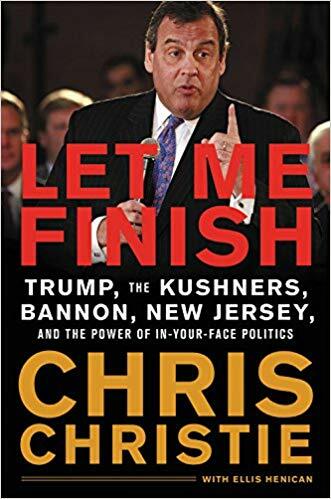 Adding to the steadily-growing pile of what we’ll perforce call “Trump books” is Let Me Finish by former New Jersey governor Chris Christie, who was a Republican candidate for the Presidential nomination Trump eventually won, was one of Trump’s earliest A-list supporters (as Christie puts it in this book, when he decides to back somebody, he backs them early). Let Me Finish is Christie’s Trump book: he characterizes Trump as a long-time friend, and his portrait of his own brief sojourn through “Trump world” is just about one hymnal short of Biblical; it’s Daniel in the Lion’s Den, if Daniel was YouTube-savvy and every single lion had a C-list lawyer. If people were civil, I answered civilly. If people were rude, they got rudeness in return. Most of politics is so phony. I think most people appreciated the fact that I wasn’t phony at all. I explained what we were doing and explained the need to do it. I was happy to debate the alternatives. The people said what they were thinking, and so did I. The central point there - that Christie is genuine, likes being genuine, responds to genuineness in others, retained his genuineness through trial and scandal, and rests in it to this day - is the core point of Let Me Finish. There is no theater more treasured in New Jersey than the theater of the “stand-up guy,” and the version of himself that Christie puts forward in this book is a protracted Parson Weems assertion that it would be an affront to his manhood to tell a lie. Just to be clear: I didn’t know about any of this. I didn’t order it or encourage it. I didn’t hint in any way that I would tolerate anybody using traffic on the George Washington Bridge for any improper purpose. This defense, so manifestly unbelievable, is repeated throughout the book in every context where open venality requires a human sacrifice: Person [X] had pure motives; Person [X] would never dream of doing Horrible Thing [Y] that’s been alleged; Person [X] was betrayed by underlings. When Chris Christie, well-known in New Jersey government circles for his temper and his peevishness, seems to have orchestrated (or ignored the orchestration of) a catastrophically inconvenient infrastructure failure (the GW is the single busiest bridge in the country), the truth is that scheming, petty staffers were the guilty ones. When the campaign of Mitt Romney, well-known in Massachusetts government circles for his temper and his peevishness, seems to be callously demanding that Christie do campaign stumping events for him even as Hurricane Sandy bears down on the Jersey shore, the truth is that scheming, petty staffers were the guilty ones: Mitt, we’re told, was both unfailingly gracious and completely unaware. Normal processes that are part of almost every major presidential campaign - the close involvement of lawyers, the vetting of questionable information that arrives over the transom, the protection of high-level staffers from outside influences - none of that existed in the Trump campaign. That fly-by-the-seat-of your-pants approach is part of what gave the campaign its grounding and its energy. But it also left the staff and the candidate vulnerable in many different ways. In other words, he’s not corrupt, he’s just staffed that way. This is pure nonsense, as a lifelong lawyer and politician like Christie must know perfectly well, but like so much else in Let Me Finish, it’s also much worse than nonsense, much darker, since it’s all enlisted in the cause of evil. Its purpose is to redeem the irredeemable, but like every other time Christie uses the gambit in this book, it’s a very carefully calculated kind of redemption. It’s an old lawyer’s precaution: a defense that seems full-throated but actually allows the defender a good deal of leeway to back out if things get rocky. Let Me Finish touts it’s in-your-face straight talking at every turn, but it has more back-door escape hatches than a New Orleans brothel. It’s all through the book in implication; any lawyer reading these pages will spot instantly all the things it’s very, very careful not to discuss. Everywhere, Christie makes a big deal of coming clean and speaking bluntly about controversies. The video of him, ice cream cone in hand, angrily browbeating a random heckler on a New Jersey boardwalk, the video of him staring aimlessly into space behind Trump at an event, the video of him greeting President Obama in the wake of Hurricane Sandy … each is related and then defended, and although the defenses ring true in the character of the stand-up guy, the plainspoken public servant, it’s impossible to avoid their common factor: these are all on videotape. This isn’t record-setting; it’s reverse-engineering. Which is bad enough when it’s applied only to a former governor and Presidential candidate, but enormously worse when it’s applied to President Trump. Christie makes good booking traction on cable news shows by sagaciously hemming and hawing about things far, far worse than political naivete, and all of it is couched in the same calculation that runs through Let Me Finish: Person [X] had pure motives; Person [X] would never dream of doing Horrible Thing [Y] that’s been alleged; Person [X] was betrayed by underlings. Mountains of evidence, a rack of legal indictments, and a phalanx of prosecutors (many of them Christie’s former colleagues) simply preclude this calculation - Christie’s insistence that Trump is the one thing he most certainly is not - innocent - has a papery quality that’s ultimately almost soiling to read. Not a single word of Let Me Finish would need to be changed if Trump were found guilty of high treason tomorrow.